Until he was forty, the Saint lived in the world. He was married, had a son John, and served as a parish priest. 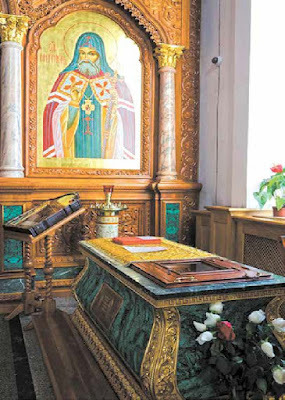 The place of Father Michael’s pastoral activity was the village of Sidorovo, situated at the River Molokhta, a tributary of the Teza flowing to the Klyazma, not far from the city of Shui (now Vladimir district). After his wife died, Father Michael received monastic tonsure with the name Metrophanes in the Zolotnikovskaya Dormition Monastery in 1663. In the Synodikon of the monastery the entry for Saint Metrophanes begins with the words: “Origin of the black clergy Metrophanes of Sidorovo.” After three years of monastic life the hieromonk Metrophanes was chosen abbot of the Saint Kosmas of Yakrom Monastery. He guided the monastery for ten years, showing himself zealous as its head. By his efforts a church was built here in honor of the Icon of the Savior Not-Made-by-Hands. 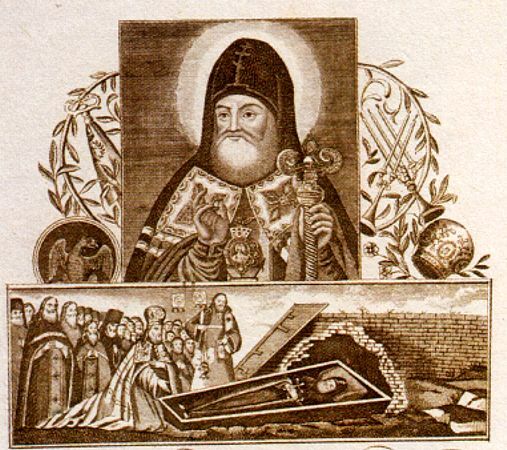 Patriarch Joachim (1674-1690), learning about the deep piety of Saint Metrophanes, raised him in 1675 to the rank of archimandrite of the Makariev-Unzha Monastery. Under the supervision of the Saint, a stone church was built there in honor of the Annunciation of the Most Holy Theotokos, together with a trapeza and bell-tower. 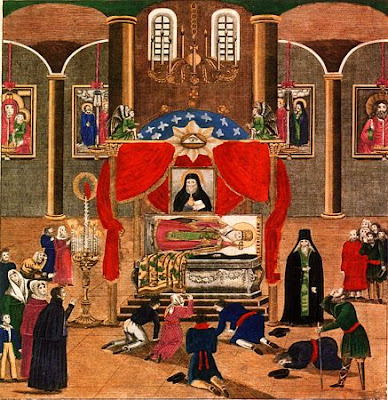 At the Moscow Council of 1681-1682 among the number of measures taken for the struggle against the old ritualist schism, and with the goal of improving Christian enlightenment among the Orthodox populace, it was resolved to increase the number of dioceses, and to open up new cathedrals at Voronezh, Tambov, Kholmogor and Great Ustiug. Saint Metrophanes was summoned to the capital and on April 2, 1682 was consecrated Bishop of Voronezh by Patriarch Joachim and sixteen archpastors. Saint Metrophanes began his archpastoral activity with the building of a new cathedral church in honor of the Annunciation of the Most Holy Theotokos, replacing an old wooden temple. In 1692 the cathedral with chapels in honor of Saint Michael and Saint Nicholas was consecrated. In the twenty years that Saint Metrophanes was bishop, the number of churches increased from 182 to 239, and two monasteries were founded: the Korotoyaksk Ascension and the Bitiugsk Trinity monasteries. And in the existing monasteries, he concerned himself with eradicating the unseemly behavior and disorder, emphasizing a strict life according to the monastic rule. 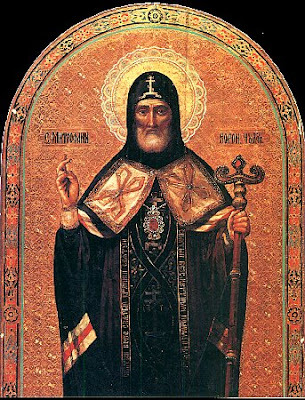 There was a great friendship between Saint Metrophanes and Saint Pitirim, Bishop of Tambov (July 28). They not only kept up a correspondence, but also met for spiritual talks. 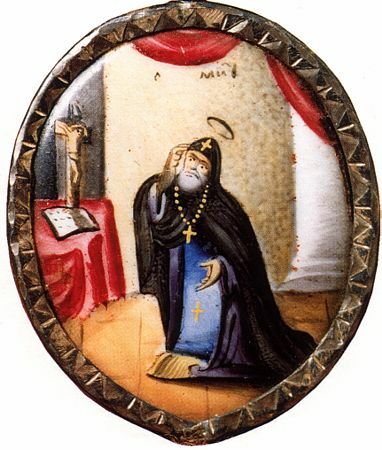 The founding of the Tregulyaev Monastery of Saint John the Forerunner was connected with the friendship of the bishops. On September 15, 1688 Saint Metrophanes visited Saint Pitirim. Three of them (the priest Basil was with them) took a stroll together to the Tambov archpastor’s place of solitary prayer, and there they chose the place for the future monastery. Saint Metrophanes, an intensely patriotic man, by his own moral authority, kind-heartedness and prayers, contributed to the reforms of Peter I, the necessity and purpose of which he well understood. With the building of a fleet at Voronezh for a campaign against Azov, Saint Metrophanes urged the nation to fully support Peter I. This was particularly important, since many regarded the construction of a fleet as useless. 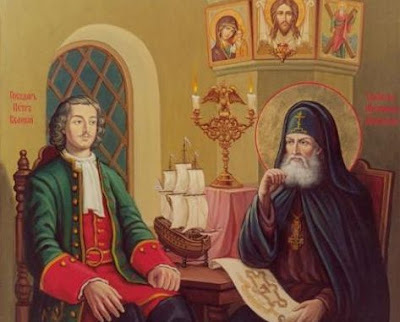 The Saint did not limit himself only to advice to the Tsar, but rendered also material support to the state treasury, which needed money for the construction of the fleet, and he provided all the means, aware that they would go for the benefit of the nation. 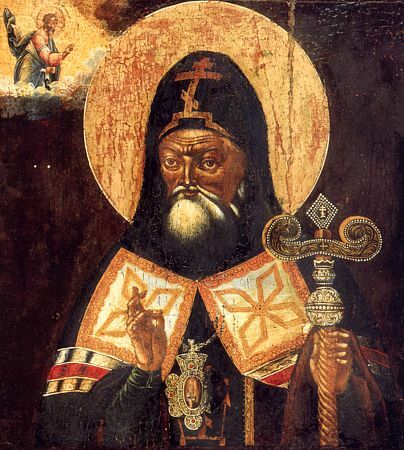 The Saint’s patriotic feelings were combined in his soul with unflinching faith and strict Orthodox conviction, on account of which he did not fear incurring the Tsar’s wrath. The Saint refused to go to court to see Peter I, since there were statues of pagan gods there, and although disgrace threatened the Saint for disobeying the imperial will, he remained uncompromising. Peter gave orders to remove the statues and from that time was filled with greater respect for the bishop. The commemoration of Saint Metrophanes was established in 1832. 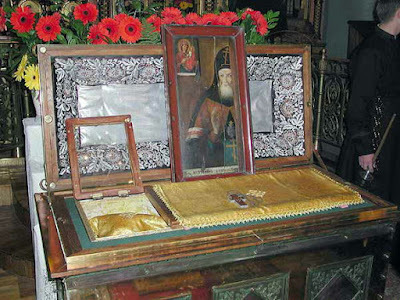 On August 7, we celebrate the translation of his holy relics. O humble Father Metrophanes, thou wast a rule of faith, and an icon of meekness in word and life for thy flock. In sanctity thou didst shine more brilliantly than the sun, and wast crowned with incorruption and glory. Pray to Christ our God to preserve thy city and all Orthodox Christians. Thou didst subject thy body to thy spirit by fasting and didst make thy soul equal to the Angels. The episcopacy crowned thy priesthood and now thou dost stand before the Master of all. Blessed Metrophanes, pray to Him to grant us peace and to save our souls.